Subtitles available in English, German, Polish, Italian, Portuguese, French and Spanish. That was exactly what I was looking for! Thank you for your amazing tutorials, you’re one step further the other tutorial that I’ve found on the web! What did you do for the low density area? You kinda skipped over it in the vid. Love your work and attention to detail, Dom! Much professional and creative tutorial, thank you for share. Very professional tutorial, I’m appreciate, thanks for sharing your skill with us. tu sei grande. Sto imparando questo metodo.Grazie per tutto. One of the best tutorials on working with hair I\´ve seen. Thanks Dom – Funny and Brilliant as always. I really thankful that i find this website ..! lot of awesomeness ! and of course free!! 😀 ..
Fantastische Arbeit – endlich mal ein wirklich nützliches Tutorial. Du bist das Tool – nicht umgekehrt! Top Notch Work! Thank you so much for your course. An excellent and clear tutorial. Thanks. ParabÃƒÂ©ns pelos tutoriais, ja assisti alguns e sÃƒÂ£o fantÃƒÂ¡sticos e seu senso de humor nÃƒÂ£o deixa que o vÃƒÂ­deo torne-se cansativo. Showw demais! Klasse, hier kann man gute Techniken lernen. Hey Dom, how did you create the new layer with the hair copy at 16:07? Did you use any command? It\´s not clear for me. Thanks for your attention. excelente tutorial, donde puedo conseguir mas vÃƒÂ­deos similares a estos ? Great Job!! I want to ask what camera use for this picture?? One of the best hair retouching tutes I have watched. Very useful! Great demo, thanks a lot! Just one question: why did you duplicate the hight frequency layer? Very good their training, would it be possible available with subtitles in Portuguese? Nice work,Thank you for this tutorial.And just asked can I use it in Profile?Thanks. Absolutely brilliant. Great tutorial. Well done.Thank you! Nice tutorial, really. But what I dislike is the outcome. Yes you can punch me in the face for it, I don\´t care. Just being honest. The Problem I have, is the puppet-fake look. It just doesn\´t look real in any way. No human being has such a perfect shaped hair. That makes it look extremly fake. Also short behind the ear, around 1cm behind, there is a very visible straight line, which looks weird. Not meant bad in any way. Just my thoughts about it. Sorry. Thanks a lot for this tutorial. 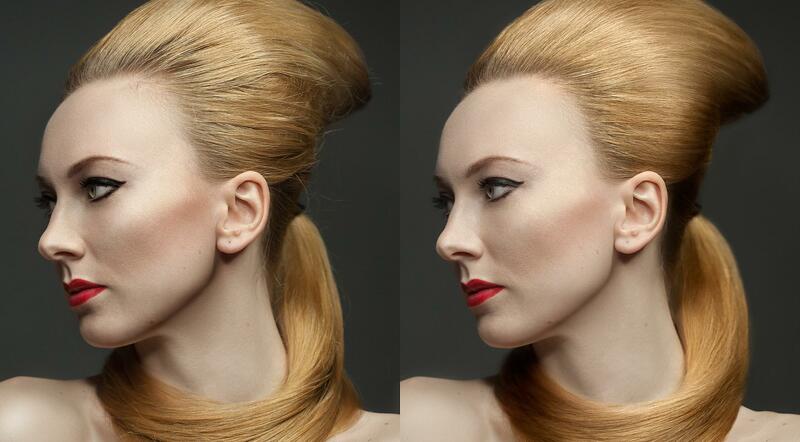 It\´s really helpfull to see the workflow of a pro\´s are retouching. I learned a lot. Thumbs up and please keep on this project. I love it. Thank you 🙂 This is amazing.